Never achieving the international stardom that they seemed to be eventually destined for in the early 1980s, XTC nonetheless managed to carve out a long and successful 25 year career as critically acclaimed cult favorites in both their native UK and the US. They've sold millions of records and have influenced a whole host of bands (including personal favorites of mine, Blur). Led by the twin songwriting talents of Andy Partridge and Colin Moulding (although throughout its history, the band direction was dominated by Partridge) and augmented by superb guitarist/keyboardist/arranger Dave Gregory, the three core members of XTC produced a vast and rich body of work that has been picked apart and dissected by their rabid fans for clues and meaning in much the same way the music of the Beatles was. However, their prior experience with an authorized biography, Chris Twomey's Chalkhills and Children, was an unsatisfying experience for the band. While author Neville Farmer states upfront in his foreword that Song Stories is not a biography in the traditional sense, the track-by-track stories behind all of XTC's music, as well as their memories and feelings on the creation of each album, serves as a quasi-biography in its own right. I first bought this book when it came out in the late 1990s and it's one I've read several times in the years since. For this review, I've given it a fresh re-reading and found yet again that each subsequent passage through the book offers new nuggets of information and insight that I either never picked up on or forgot since my previous readings. Starting with a brief history of the band's origins in their native Swindon, England, the book is broken into chapters devoted to each album in chronological order. The first two chapters are devoted to their first two albums, White Music and Go 2, which featured their original line-up of Partridge on guitar/vocals, Moulding on bass/vocals, Barry Andrews (the only member not from Swindon) on keyboards, and Terry Chambers on drums. With Andrews' departure in late 1978, childhood friend Gregory joined and the classic XTC line-up was completed (Chambers would eventually depart in 1983). From here, the book goes through every album, single, B-side, and side project up to the date of the book's publication in 1998. Serving as a guidebook to XTC's body of work as well as a quasi-biography, each chapter begins with a short synopsis of the years(s) of a particular album's creation by Farmer. This is then followed by a section of interview Q&A between Farmer and Andy, Colin, and Dave, followed by a song-by-song breakdown of each song recorded for the album as well as associated singles and B-sides. 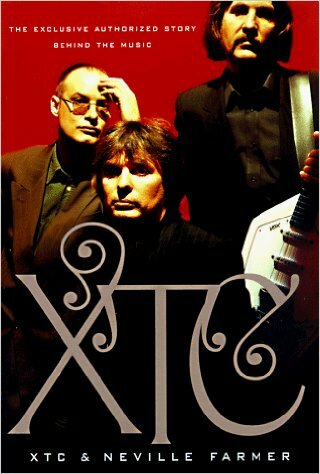 The exchange between the three XTC members and Farmer is easy, comfortable, humorous, and candid owing to not only their long working relationship with the author, but also due to the friendship and trust that developed with him during those years. The insight offered in each chapter is really interesting and enlightening as the band (especially Partridge) are brutally honest and open about their states of mind, personal lives, and moods surrounding each album's creation. The song breakdowns offer much in the way of revealing the hidden meanings (or lack thereof) for every song, as well as what the inspirations and creative process behind each of them was. What is also revealed is that the three band members have a deep, varied, and encyclopedic knowledge of music, ranging from the Beatles, Kinks, and Who to dance music, English Music Hall, medieval, classical, and just about everything in between. All of this is woven into their music, as are their individual passions for comic books, gardening, jazz, blues, toys, and more. The book is especially helpful in charting and understanding their evolution from a typical write-record-tour-repeat band in the late 1970s and early 1980s toward a Beatles-esque studio-only band following Andy Partridge's panic attacks and stage fright, which culminated with their cessation of touring in 1982. Along with this, their struggles and continual penury under the yolk of their first manager is explained, as is the five-year strike where they refused to record any music for their label, Virgin Records, in the mid-1990s. The book ends with the band in the midst of writing and recording what would end up being their final two albums, 1999's Apple Venus and 2000's Wasp Star: Apple Venus Vol. 2 (both of which were untitled as of the publication of the book), as well as Dave Gregory's departure from the band in the during the recording sessions. While not a biography in the truest sense of the word, Song Stories is still an essential book for any fan of XTC and serves its dual purpose well. In light of what I've read regarding the band's attitude toward their earlier authorized biography mentioned above, Chalkhills and Children (a book which I intend to seek out and read in order to see for myself), and the fact that Song Stories was written by one of their close friends, this book should be considered the final and most accurate and informative word on this unique and fantastic band, especially in light of their final split in 2005. It's not a perfect book: I would have liked more photos and perhaps more depth as to the meaning behind the songs as in many cases it's a bit superficial. More information straight from the band's own words regarding their music can be (and has been) found elsewhere, mainly online, but on the whole reading Song Stories is a satisfying and richly rewarding experience. As someone who has read it numerous times myself, I can attest that just like XTC's music, it invites multiple visits toward perpetual enjoyment.